I dreaded making these pages. 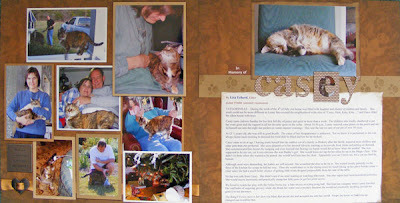 It has been over a year that our Casey Cat has been gone. She was with us for over 10 years of her life. It was amazing the presence a little 8 lb cat could have. I'll always miss her. Making the pages wasn't as painful as I expected. The photos are all ones taken in the last few months. The very last one made of her is in the "e" of her name. She had gotten 'caught' upstairs when Jaime's family was here. She came in early that morning and upstairs with me. Then the kids got up before she could make her escape. I photographed her standing at the top of the stairs trying to figure out how to get out without the children clambering to pet her. She loved to be petted; she just wanted it on her terms. There are dozens more pictures, many had already been in other scrapbooks. In fact, she was a tiny figure supervising Lenny's worktable building in the photo on yesterday's post - a scrapbook page from 2006. To use this variety of photos, I resized, cropped and printed them. I didn't get too carried away figuring out the exact size I would finish with. Then I cut some down leaving a little white showing for mats. I used other neutral papers from my scraps bin for matting the others. Dimensionals help some photos stand out. 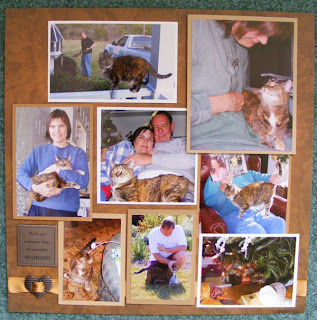 The collage effect helps show how big a part of our daily lives she was.